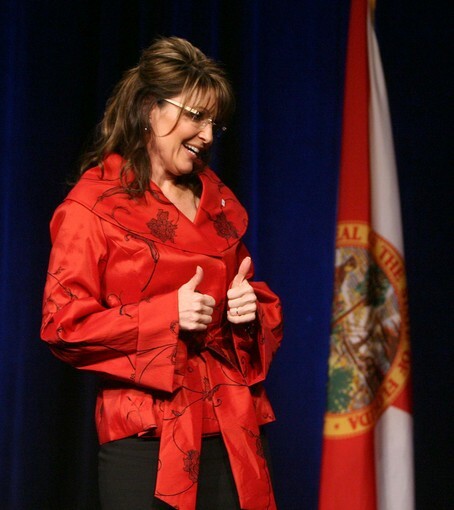 Governor Palin rocked the Orange County, FL Lincoln Day fund-raiser, attracting over 1300 supporters and raising over $110,000 (Damron, 2010, ¶1). In her speech delivered at the Shingle Creek Resort, Gov Palin targeted liberals, the media and the Washington elite (Damron, 2010, ¶1). “Americans get it,” Palin said. “In Washington, they don’t get it” (Damron, 2010, ¶1). She said “the GOP would restore ‘common sense’ to government in the … November elections.” (Damron, 2010, ¶1). Photo by Joe Burbank, Orlando Sentinel. Gov. 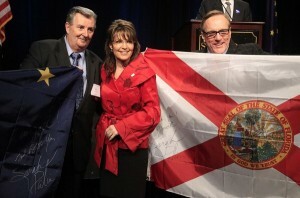 Sarah Palin poses with flags of Alaska and Florida --that she autographed-- with guest Jack Burchill (left), and Orange GOP chairman Lew Oliver, at the Orange County Republican Executive Committee Lincoln Day Dinner, at the Rosen Shingle Creek, in Orlando, Friday. “On Friday, Palin advocated drilling for oil and natural gas to gain energy independence but said nothing specifically about such exploration off Florida’s coast, a source of heated political dispute” (Damron, 2010, ¶6). Photo by Joe Burbank, Orlando Sentinel. Governor Sarah Palin is welcomed to the stage at the Orange County Republican Executive Committee Lincoln Day Dinner, at the Rosen Shingle Creek, in Orlando, Friday. Gov Palin remained on message with Reagan Conservatism, advocating “lower taxes, less spending, more freedom and smaller government,” (Damron, 2010, ¶6) and also called for Floridians to unseat US Rep. Alan Grayson, a Democrat from Orlando “for the rest of America” (Damron, 2010, ¶7). Photo by Joe Burbank, Orlando Sentinel. Governor Sarah Palin marvels at meeting Angie Langley as she is welcomed to the stage at the Orange County Republican Executive Committee Lincoln Day Dinner, at the Rosen Shingle Creek, in Orlando, Friday. Langley is known for her web site lambasting democratic Rep. Alan Grayson. This stop is the latest in Governor Palin’s international speaking tour, which also includes stumping for US Rep. Michele Bachman, Senator John McCain and Governor Rick Perry. Today, Governor Palin will speak at the Taking our Country Back Tour event in Tulsa, OK.